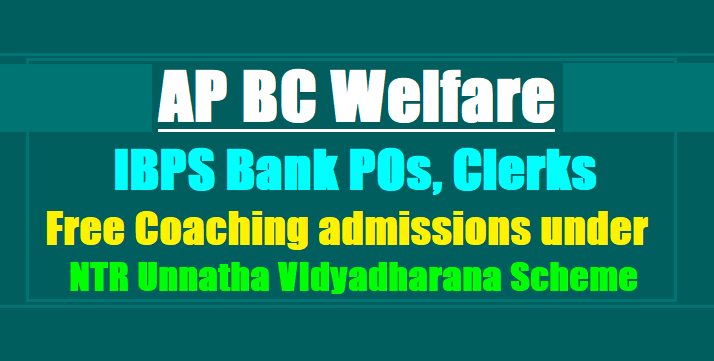 NTR Unnatha VIdyadharana Scheme Bank POs, Clerks Free Coaching 2017: AP BC Welfare Bank POs, Clerks Free Coaching 2017, AP Bank POs, Clerks Free Coaching 2017, AP Bank PO's, Probationary Officers, Clerks Recruitment Free Coaching Notifications, Bank Clerical Cadre Recruitment Free Coaching Admissions 2017, IBPS Bank POs, Clerks recruitment Free Coaching admissions, AP BC Welfare Notification for free Coaching to Recruitment in Probationary Officers, Clerks in various banks in India. Government of Andhra Pradesh, Backward Classes Welfare Department has issued Free Coaching Notification for Recruitment of POs, Clerks under NTR Unnatha VIdyadharana Scheme. The AP BC Welfare invites the Online Applications from the eligible candidates belonging to Backward Classes (BC), Scheduled Classes and Scheduled Tribes for free coaching to IBPS/SBI Probationary Officers, Clerks. The selection process of the candidates for the coaching Programme details as follows..
A total of Rs 20,000 (Rupees Twenty Thousand Only) which will btu towards - Financial Assistance would be provided towards coaching fees up to Rs 12,000 (Rupees Twelve Thousand only) which will be credited directly to the institute's account. Financial Assistance would be provided for training with coaching fees up to Rs 7,000 (Rupees Seven Thousand only) which will be credited directly to the instituters account. grant. This will be credited on furnishing of the course completion certificate. III. Course duration for the Bank POs and Clerks is months. 1. The applicant should belong to Backward Classes of Andhra Pradesh. 3. Age: Eligibility for examination shall be as per Bank Notification guidelines. 4. The applicant should not have availed himself or herself of any amount under any other Government scheme for the same purpose. Educational Qualification: Candidate should have passed any Degree course. 2. OBC Candidates have 3 years relaxation. 3. Ex-Servicemen Disabled Students have 5 years / 8 Years, subject to maximum age of 50 years. Educational Qualification: Candidate should nave passed any Degree course. 1. Eligible candidates who wish to apply have to submit their applications through ONLINE mode only by login into www.bcwelfare.ap,gov.in. VII. Passport size photograph (in PEG format up to 30 KB size. When the bank coaching counseling conducted.